Making good on a threat of election day violence, the Taliban sliced off the index fingers of at least two people in Kandahar province, according to a vote monitoring group. After they cast their ballots, the fingers of Afghan voters are stained with ink to prevent them from voting multiple times. The fingers of the two women in Kandahar, a stronghold of the Taliban, were cut off because they voted, said Nader Naderi of the Free and Fair Election Foundation. The Taliban had vowed to disrupt Thursday’s election and the risk was too great for some Afghans to venture out, especially in the southern provinces that form the heartland of the radical Islamist group. Just days ahead of the election, U.S. Marines and other NATO forces carried out military operations to clear and hold sectors that have long been in the Taliban grip, and free up the population to vote. Sporadic attacks on election day killed 26 people and injured scores more. Still, Afghan officials hailed the voting as a success. On Friday, the European Union echoed those sentiments and congratulated Afghanistan for holding elections under what it called challenging circumstances. Watch how counting is under way in Afghan provinces “While deploring the loss of life, we believe that the security measures successfully prevented any major disruptions of the elections,” the E.U. said in a statement. Preliminary results will be announced on a piecemeal basis from Tuesday to September 5, according to the Independent Election Commission of Afghanistan. Zekeria Barakzi, the deputy chief electoral officer for the commission, told CNN that as of Friday, the counting was complete in 30 of Afghanistan’s 34 provinces. Barakzi said that after September 5 there would be a period — which could last a month — of accepting objections and complaints about the elections. A spokeswoman for the American Embassy in Kabul said the United States has “every confidence that they (the commission members) will be able to finish this part of the electoral process in a transparent fashion” Meanwhile, the top two presidential candidates — President Hamid Karzai and his chief rival Abdullah Abdullah — positioned themselves as the likely winners in the race. Karzai’s campaign team claimed Friday he was on track for victory in the country’s presidential election, while Abdullah also said he was leading the vote. Their claims came as election officials said the results of the vote, seen as a judgment on the Karzai government’s efforts in tackling Taliban insurgents, poverty and corruption, would be rolled out starting August 25. Meanwhile Abdullah, seen as Karzai’s main challenger, told Associated Press Television that he believed he was leading, characterizing the vote count as “promising” despite what he described as sporadic “rigging” across the country. Thursday’s election, the country’s second since the 2001 fall of the Taliban, was held amid a climate of fear as militants threatened to violently disrupt the process. 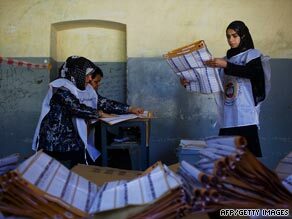 Violence on voting day killed 26 Afghans and injured scores more. U.S. President Barack Obama offered strong praise Friday for the election, calling it “an important step forward” in Afghanistan’s struggle for democracy in the face of ideological extremists. “The future belongs to those who want to build, not … destroy,” Obama said at the White House, adding that he was struck by the “courage in the face of intimidation” demonstrated by the millions of Afghans who went to the polls.